When vintage shop owners Jennifer and Ronnie decided to plan their Philadelphia wedding at Bartram’s Garden, they knew two things: they wanted a vintage decor, and they wanted to DIY nearly every detail! Using their expertise from running Hoof & Antler, they created an exceptional vintage garden party on the outskirts of the city. Every inch of their wedding day was expertly styled, and no surface was left without lush and organic florals and greenery from Fresh Design Florist. To bring the garden party theme full circle, they set up vintage lounge seating areas (complete with a box of cigars) and yard games for the guests to enjoy. We love how the couple used so many natural elements to bring their dreamy garden wedding to life. We especially love that Tree of Life Films & Photography was there to capture it all in stunning detail! Living in the city, we wanted to stay true to our Philly roots while simultaneously being surrounded by the beauty of nature, which is not the easiest of tasks in a large city! Additionally, we run a vintage home decor and clothing business, so it was important for us to incorporate vintage vibes throughout the event. Our love of all things vintage is a huge part of who we are as a couple (we went thrifting as part of our first date! ), so it was essential to incorporate these elements. When all was said and done, we located a beautiful botanical garden nestled on the outskirts of the city and created a “vintage garden party” look and feel! We created or procured most of our wedding decor. 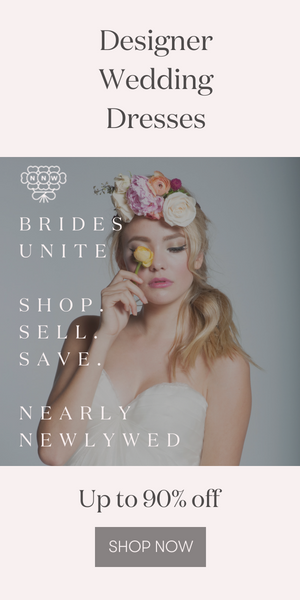 We have a small vintage decor business, and I (the bride) am a graphic designer. We also had help from my father, who is a carpenter, for all of our power tool needs. Our list of DIY projects included: all the paper materials, which we printed and crafted at home; the table runners, table number stands, and cake stands; the ceremony archway; DIY photo booth background; and the giant JENGA game. Luckily for us, we have lots of incredibly talented friends, so we decided to put their talents to good use throughout the day! Our wedding ceremony pianist and violinist, our officiant, and our DJ were all close friends of ours, which, coupled with our bridal parties, really added to the overall sense of family and celebration. Having all of our favorite people taking part in the event is something that we’ll never forget! Being an artist, and an avid DIYer, I wanted to finely curate every detail of our wedding. For not just my own sanity, but that of my future husband, I quickly realized we could not do it alone. We needed a planner — someone to hold our hand along the way, and take care of all the day-of logistics. Hiring a day-of planner will allow you to relax, maximize time, and really enjoy your day. Plus, by opting to DIY everything possible, we were able to hire a planner at a budget friendly price. We cannot express enough how many headaches we saved by taking this approach. Congratulations to the newlyweds, Jennifer and Ronnie, and a huge thanks to Tree of Life Films & Photography for sharing this beautiful wedding with Junebug! If you love the idea of a garden wedding, you need to see Alexandra and Joshua’s southern glam garden party wedding at The Venue at Tryphena’s Garden!